Loren Noveck experiences the limits of unchecked invention. A Billion Nights on Earth feels like a giant toy-box for theatrical designers–it’s full (overfull, I would say) of dazzling effects and objects cherry-picked from a multitude of stage and visual-art traditions: Japanese theater (their materials specifically mention the Kabuki tradition but to me it looked more like Bunraku puppetry), giant inflatable props that seem to reference sculptors like Jeff Koons and Claes Oldenburg, a clever puzzle-box of a set piece that transforms like a magician’s cabinet every time a door is opened or closed. The show is intermittently magical in a dream-logic kind of way when something beautiful and inexplicable floats by, but it operates on more of a magpie aesthetic than a cohesive one–and even in its own magpie/dream logic, there are so very many things going on that I found it hard to grasp and enjoy any one of them. The moments of wonder are wondrous indeed–when a pile of fabric suddenly inflates itself almost instantaneously to become a milk carton ten feet tall; when a chimney pipe blasts off from a roof and becomes a rocket ship–but the motifs and patterns seem to either echo each other ad infinitum or jump from one thing to the next with seemingly no connection. We begin in a house at night, where a little boy (Winslow Fegley) tries to creep out of bed to watch a rocket; then he discovers his favorite stuffed whale is missing and stages an expedition with his other stuffed toys to rescue it by ship. Then he finds a magic ice kingdom behind the freezer, where he (and later his father, played by the boy’s real-life father, Michael Fegley) almost drown, almost freeze, then end up lost in space on a crashed rocket, ultimately cycling back to a subway expedition to find the lost whale, ending up back at home. Each of these scenarios contains an intriguing visual kernel that could sprout a full, more coherent show: The house comes apart and reassembles, and the father’s and son’s domestic patterns repeat themselves in humorous ways. The ice kingdom has clever fabric-as-water effects and an onstage firepit. The space landscape has a shadow puppet sequence. 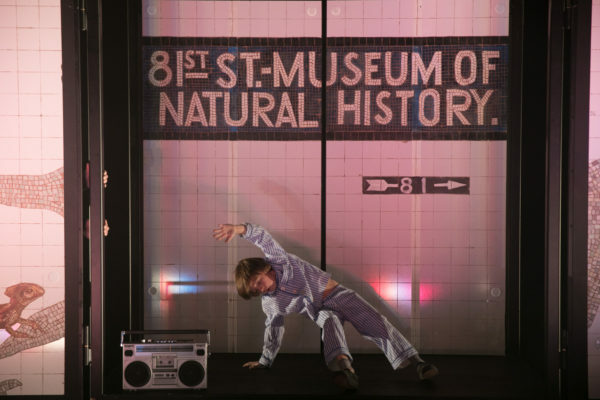 The core set piece for the subway segment, where doors open and close and allow transformation and a sense of movement, is beautifully clever–but by the time you’ve begun to appreciate its cleverness, the show has moved on to something else. The giant inflatable replicas of the boy’s stuffed animals with which the show ends are delightful, but they take more time to get into place than they spend actually appearing in the piece. Perhaps the show simply trades in a particular species of whimsy and wonder that eludes me. Still, it felt overstuffed and overelaborate, as if artists used to working with the normal constraints of budget and resources were suddenly given the chance to make everything they could possibly imagine, just to see how it worked. The magic of experimental/independent theater often is born from its constraints; magic things can happen when “necessity is the mother of invention” joins hands with “the show must go on.” Here, I felt the opposite was also true: limitless, unchecked invention is an extraordinarily seductive opportunity for an artist, but perhaps not so much for the audience. A Billion Nights on Earth runs to November 18, 2017, in the BAM Next Wave festival. More production info can be found here.